With a voice of incredible richness and depth, Felicia Loud is the Northwest's premier soul singer. 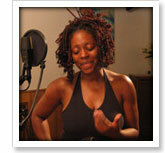 Fluent also in jazz and blues, Felicia records and performs with her band The Soul. Recently, Felicia has won raves for her starring turns in Crowns at the Intiman Theatre and as Billie Holiday in Lady Day at Langston Hughes Performing Arts Center.